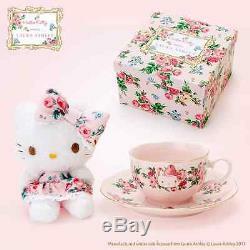 Gift Hello Kitty meets LAURA ASHLEY Tea cup set & mascot Rosa JAPAN FS NEW. 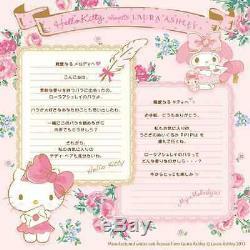 Gift Hello Kitty meets LAURA ASHLEY Tea cup set & mascot Rosa JAPAN Last stock! Mascot (sitting state): about 9 × depth 8 × height 13 cm. Cup: 9 × height 5.5 cm. Saucer: about 15 diameter × 2 cm height. 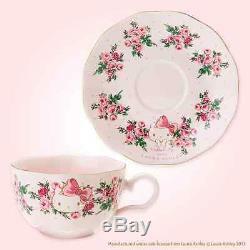 Mascot: polyester, cup & saucer: porcelain, BOX: paper. North America Central America Middle East AU, NZ. Packing We promise packing professional. We pack all products to a professional. We pack it severely very carefully. Most Products are rolled by Air Packing, or are severely rolled in Papers. The product is fixed with packing materials or paper well. We promise that you deliver to the customer in perfect condition the product! Return If by any chance the Product is damaged, or different has arrived, we will respond as soon as possible. We are limited to the unused Product within 30 days from the Arrival in the only Case of the Above Correspondence. We have Policy some for Sale. We guarantee all Maker Regular Article, Authentic Product about the Product which we sell. We believe that to deliver to Customer to have the responsibility and also the most important, with the Best Products. Thank you for Reading(^_^) HimeHime8. International Buyers - Please Note. 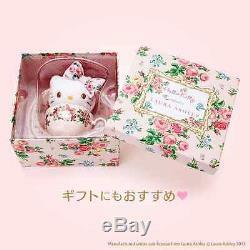 The item "Gift Hello Kitty meets LAURA ASHLEY Tea cup set & mascot Rosa JAPAN FS NEW" is in sale since Saturday, December 3, 2016. This item is in the category "Collectibles\Animation Art & Characters\Japanese, Anime\Sanrio, Hello Kitty\Hello Kitty\Other Hello Kitty". The seller is "himehime8" and is located in Tokyo. This item can be shipped worldwide.